Ramen, oh, ramen... you are taking the Philippines by storm! Ha! It's ramen here, there, and everywhere. Each noodle place is trying to capture the hearts of Filipinos by offering something new, unique. 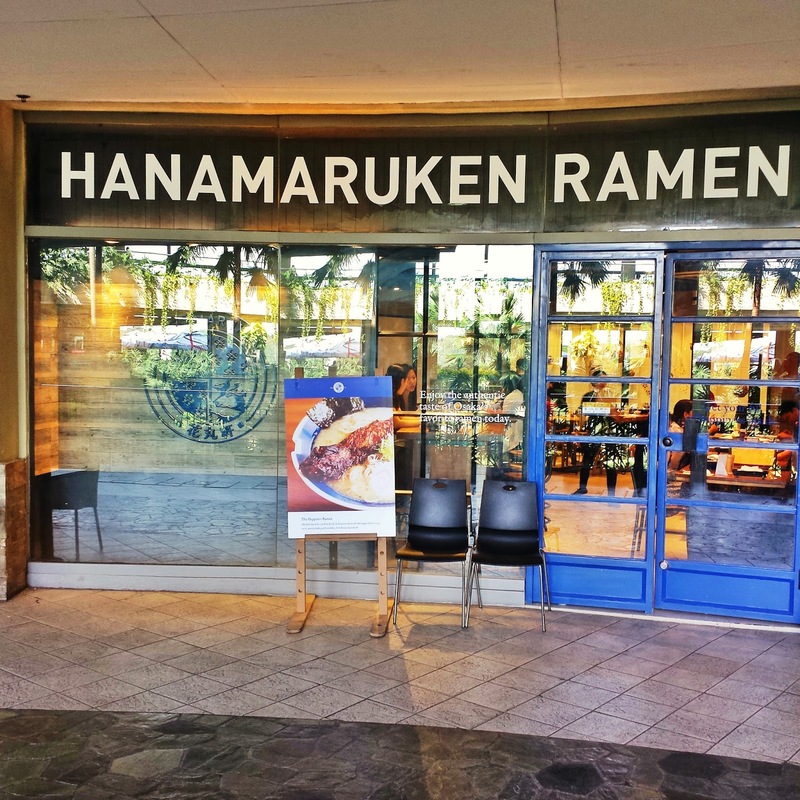 Hanamaruken Ramen, a popular restaurant in Osaka has opened its doors to the public since November 25, 2013. Having 40 branches in Japan, the local owners of Hanamaruken Ramen definitely loved what they've eaten for them to bring it here in Manila. This new ramen plance is located at the alfresco side of TriNoma and has a sign board that you definitely won't miss. Inside the restaurant is a minor resemblance of the look and feel of some Osaka dining places. The lighting gives the place a warm ambiance, with wooden-polished tables and chairs to match the look. On one side is a glass window pane with displays of Japanese ornaments, and another side with Japanese words painted on the wall. 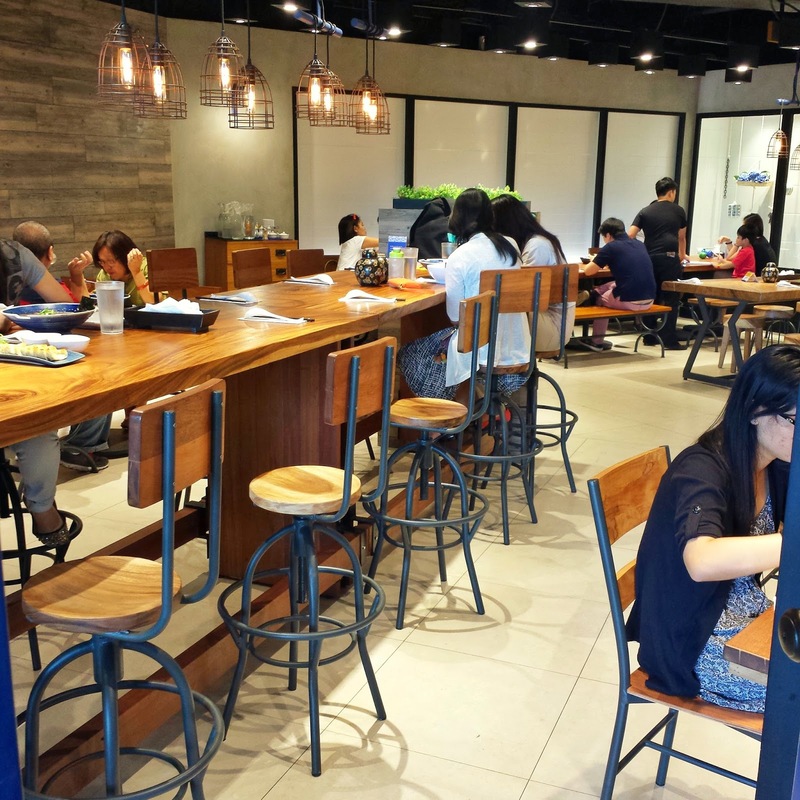 Depending on how many you are in a group, Hanamaruken Ramen has different sizes and types of tables and chairs. What's good about this restaurant is that it has plugs and sockets on the wall. I guess the owners brought their techie side on that seemingly minor (but major) restaurant feature. The menu is pretty straight forward with just four sections: Ramen (6 choices ranging from Php280-Php480), Rice Bowls (5 choices ranging from Php140-Php250), Sides (4 choices ranging from Php120-Php220), and Drinks (2 choices at Php80). I like the fact that you don't have to think too much before being able to order. As a starter, JR and I ordered a Hot Green Tea (Php80). It's actually written as "Iced" on the menu, but you can request it to be otherwise. 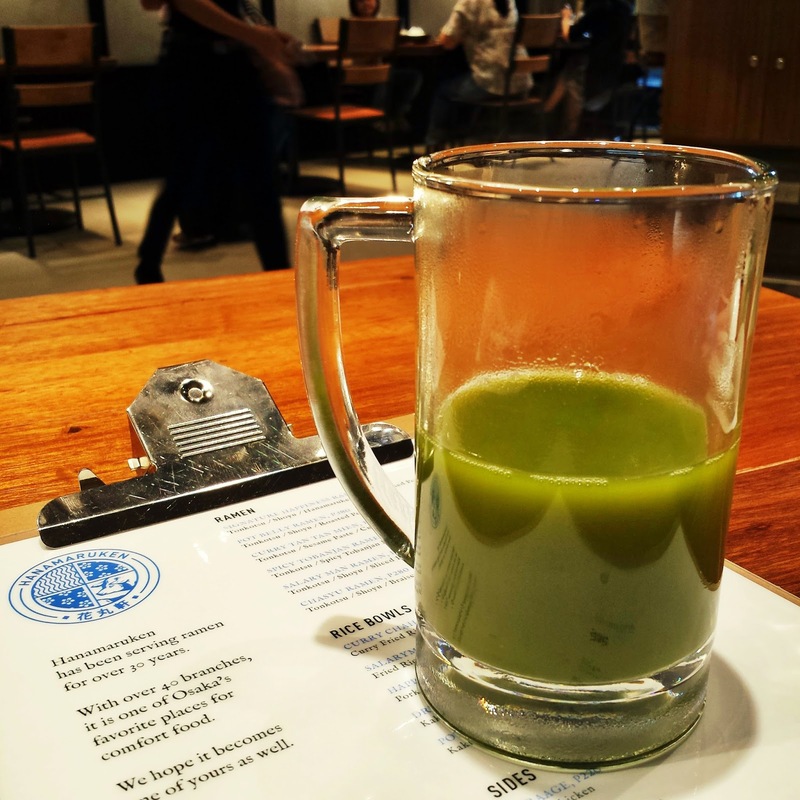 The matcha green tea came in a half-filled transparent glass - it'll look full glass when served with ice. As mentioned in my previous posts, I'm not a green tea fan, but I never say "never". Guess what, I liked it! It's actually really good with just the right sweetness. Don't forget to stir it before drinking. Since the Karaage (Php220) is not available, we opted to call for the Gyoza (Php150) instead. Our order came with 8 pieces of pan-fried dumplings with gyoza sauce and chili oil. It's best to mix both sauces for a bit of spice. 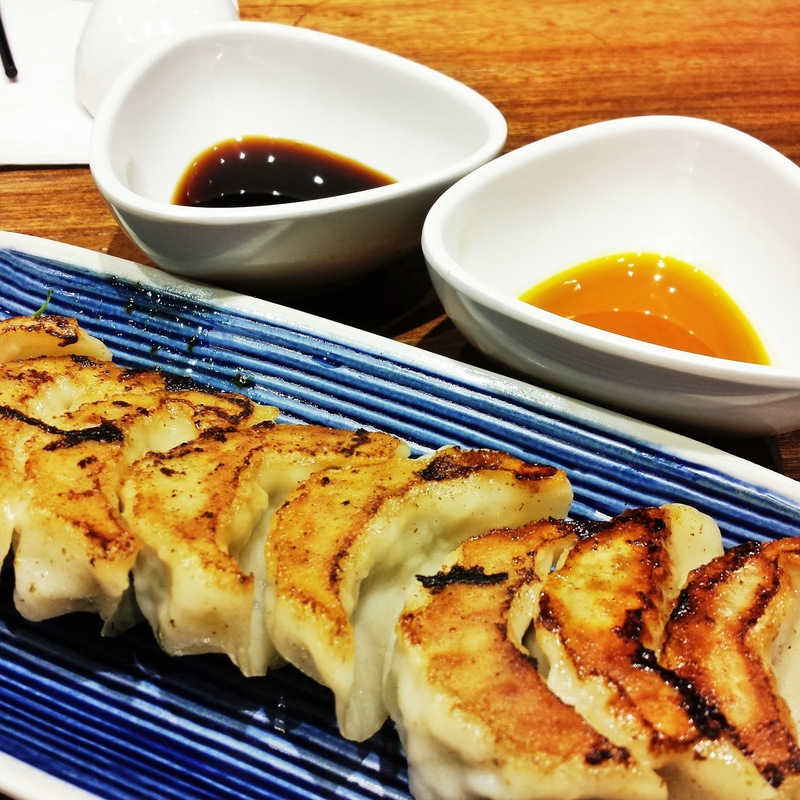 Hanamaruken's gyoza reminds me of Osaka's version that's chewy and with just the right size. 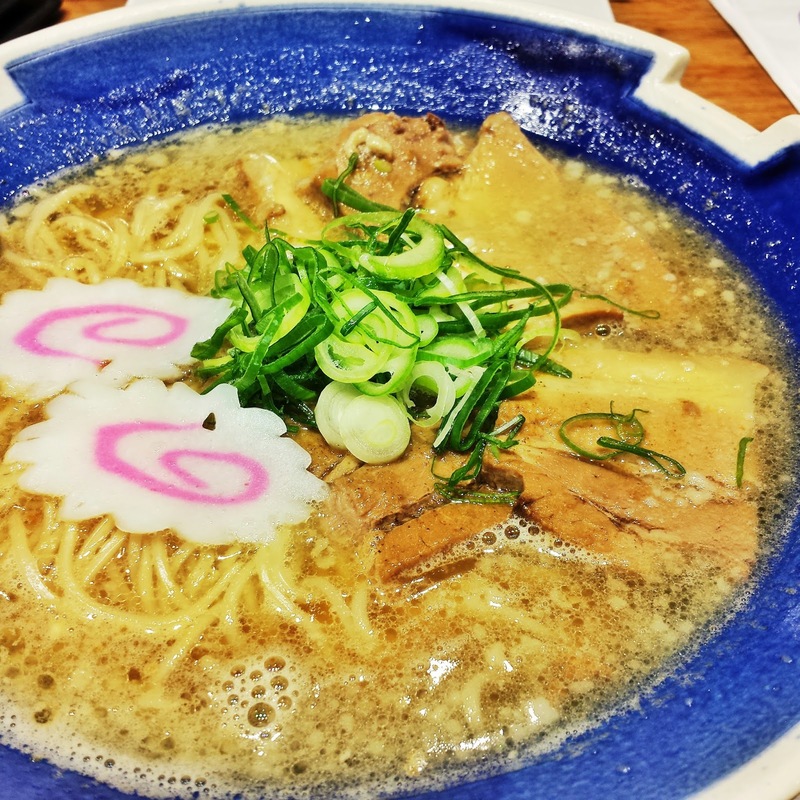 Hanamaruken is known in Osaka for its Signature Happiness Ramen (Php480). 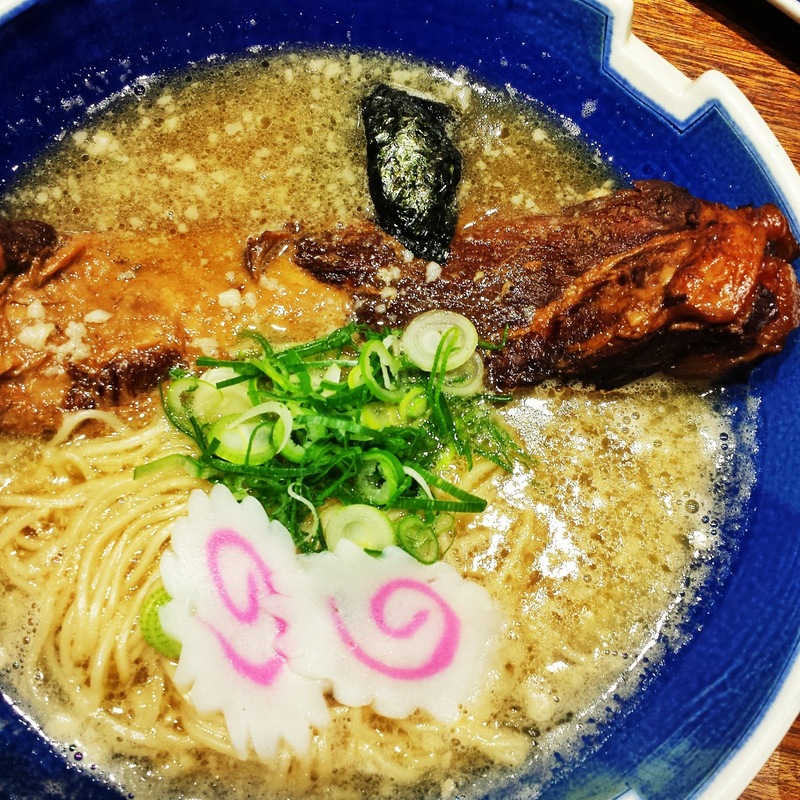 What sets it apart from all other ramen places is its huge slab of slow-cooked pork ribs that's flavorful, tender and soft - a sign that it took hours of preparation to bring it to its texture and taste. We also got to try the Pot Belly Ramen (Php380) that had big pieces of roasted pork belly. I love the fact that this restaurant appears to be generous in meat sizes if compared to other ramen establishments. Both orders used shoyu tonkontsu broth soup base. As such, it was light and very classic with a bit of fatty taste. Good thing the meat was flavorful, which blended well with the soup. Every single sip of the soup gives warmth to the body, which is just great for a cool weather that we have now. I'm the type of guy who likes my ramen rich with a lot of garlic. What Hanamaruken Ramen offers is not exactly that, but nevertheless a must-try for its tasty slow-cooked pork ribs and roasted pork belly. For more information, visit their Facebook page or Twitter and Instagram @Hanamaruken_PH.